Born in London on April 13, 1934, Goodall knew at an early age that she wanted to study animals. She was fascinated by the wildlife and barnyard creatures surrounding her country home. After reading Dr. Doolittle, Goodall became enamored with the idea of traveling to Africa. Once she had completed her secondary education, she was invited to visit the home of a friend in Kenya. Goodall worked to earn the necessary money and soon was on her way. During her visit she met Dr. Louis Leakey, a famous anthropologist. Impressed by her desire to study in Africa, he hired her to help with his research on prehistoric humans. Goodall’s patience, attention to detail, and insight seemed to Leakey the ideal qualities of a researcher. He asked her to undertake a special project for him, studying chimpanzees. He felt that by studying chimpanzees, important clues to early human behavior might be discovered. Goodall accepted the challenge. Thus began the research that would be her life’s work. Goodall studied the chimpanzee groups that lived in the Gombe Game Reserve in Tanzania. The study that began as a three ­year project in 1960 continues today. It was the first field study of non­human primates. Goodall pioneered techniques for observation and data collection. Unlike laboratory animals, the subjects were not always available or willing to be observed. Goodall spent months acclimating the chimpanzees to her presence. Her detailed, long ­term study discovered many new facts about the primates. They were not strict vegetarians as previously had been thought: insects, small animals, and even young baboons were part of their diet. The chimpanzees also exhibited behaviors thought unique to humans, such as tool making. This forced a re­examination of the definition of human intelligence. They were like humans in other ways, too, having complex codes of behavior and social systems. Goodall’s discoveries were groundbreaking. Cambridge University recognized her accomplishments and granted her a doctorate in 1965. As the years went on, the research expanded. Goodall became more concerned with the preservation and treatment of chimpanzees. 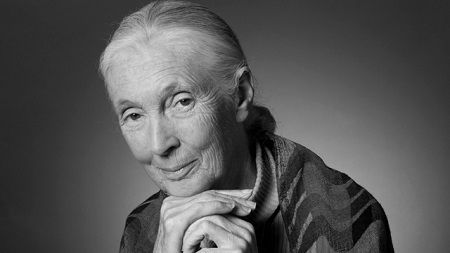 In 1975, the Jane Goodall Institute was created in the United States to encourage education about the endangered primates. In The Chimpanzees of Gombe: Parterns of Behavior, published in 1986, Goodall outlined her observations, and in My Life with the Chimpanzees, published in 1993, she made her work accessible to a wide­ ranging audience. She continues to work today, studying chimpanzees and teaching the rest of the world what she has learned. Goodall prodded the scientific community and the world with powerful research techniques and valuable information about chimpanzee behavior. Goodall showed how careful documentation and attention to detail could provide data not seen in the laboratory. Following Goodall’s example, long­ term study also became a hallmark of ethology. She has observed the chimpanzees for over 25 years and continues to discover new behaviors and to answer questions about their complex social system. Her methodology is now used by field researchers around the world in a wide range of habitats. Through her writing and frequent interviews, Goodall has also become a spokesperson for conservation and the protection of endangered primates and for the ethical treatment of chimpanzees in particular. The Jane Goodall Institute furthers these objectives as well. As a new generation of scientists continues her research, Goodall’s findings about the behaviors of chimpanzees are offering clues to early human behavior. These insights into human evolution pose many questions that spark further research. Her public role as a researcher and conservationist provides an important role model for future generations of young scientists who want to follow their dreams, as she did.